A Bayfield summer resident, who is also a professional planner with a Masters in Urban Design offered Bluewater Council some food for thought when it came to the proposed development of a 20-seat Tim Hortons Restaurant, convenience store and self-serve gas station at 89 Main Street South in the village during their Committee of the Whole meeting on July 4. Deanne Mighton is Senior Urban Designer at the City of Toronto but has been coming regularly to Bayfield since she was five years of age and now brings her own children to the village. Mighton then directed council’s attention to statements within Bluewater’s Official Plan (Pg. 28) that states commercial or industrial may be permitted subject to: the use is compatible with the character of the area; adequate services and storm drainage are available; highway commercial areas will be developed to complement and not compete with or undermine the core area commercial functions. She then went on to explain how the current proposed design of the development does not complement the aesthetic qualities found throughout the village and that it does compete with the core area as there are already established coffee shops, convenience stores and two gas stations. “The design is quite general, it is horizontal siding, concrete and asphalt, the colors are quite dark and historically the village buildings are light. It does not take any clues from the heritage. The people who have designed it have copied and pasted it 60 times across Southwestern Ontario. They have not taken any time to fit it into its location,” Mighton told council. One of the major concerns Mighton expressed was the planned signage for the development. Mighton also pointed out that the plan for vehicular stacking (drive-thru) allows for 15 cars that would imply large traffic volumes are expected. In Toronto plans for car stacking are set at 10 cars maximum. She also highlighted the fact that the proposal has no connections to adjacent commercial uses or shared access. “There is no safe way to get to the liquor store or the grocery store. There is no pedestrian access. Best practices should be put in place if council is going to endorse this project. Council should be asking for modifications on these points,” she said. “The village has a small population and many franchises have limit distance agreements. I have seen situations where people have gotten excited because a Loblaws was planned for their neighborhood only to learn after the fact that due to these agreements they were presented with a Price Chopper instead,” she explained. She also sited Page 30 of the Official Plan regarding Bayfield’s Community Design when it comes to appropriate levels of buffering between uses of land to minimize conflict and increase compatibility. “The development is adjacent to residential property and the project is pushed back against these neighbors with no allowances for buffering,” she said. The Official Plan (Pg 30) states that the municipality will encourage a continuing reduction in the existing levels of air, water, ground and noise pollution. In conclusion Mighton also asked council to consider the economic goals and aspirations of the existing businesses in the community. Bayfield Ward Councilor Bill Whetstone thanked Mighton for the work she had done to present to council. He made council aware that he has received a number of emails and phone calls regarding the project and a leading concern is the sewage issue. “It is capacity versus volume. Let’s face it Tim Hortons gets used as a bathroom for travelers along the highway. We have property owners in the village that are waiting to build but can’t do so because of the sewage issue and we could face potential litigation if this development proceeds and these property owners are left waiting,” Whetstone said. Mayor Tyler Hessel also thanked Mighton for her presentation. He then asked that she provide council with a written statement that could be added to the existing presentation outlining the additional comments she made in her evening’s address. Hay East Ward Councilor John Becker spoke in favor of the development commenting that he wished they could get one for Dashwood. “Tim Hortons can do good things for the community. They hire people. They send children to camp. They support the local fire department. They support the community,” Becker said. He also stated that competition for gas stations is a positive, as it would keep the price of gas down. Mayor Hessel also updated council as to the state of the development. He noted that the developer is working with the MTO and also on the storm water issues and he doesn’t expect that they will be back to council for sometime. 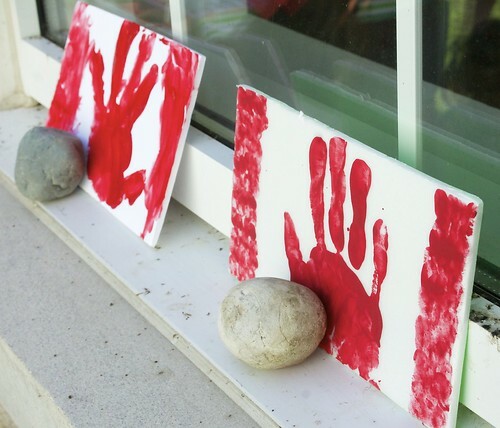 Thomas Lewandowski, aged two of St. Catharines, ON, got really creative with the red paint when designing his Canadian flag at the craft time hosted by the Friends of the Bayfield Library on Saturday. 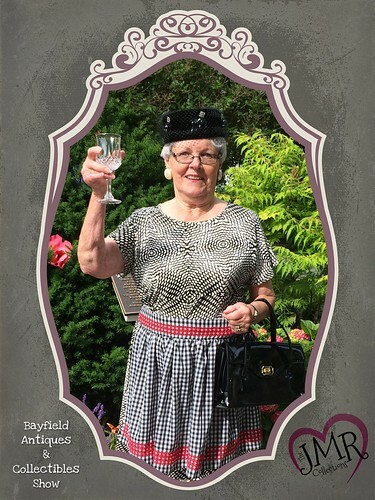 The Canada Day celebrations continued on July 8 when the Friends of the Bayfield Library hosted a time of crafts and games outside at the library. The youngsters had some fun getting creative using red and white with opportunities available to make a flag, a beaver, a lantern and a bird. They could also paint a flowerpot, try a Canadian I Spy game and join in a scavenger hunt. Handprint Canadian flags was just one of the clever crafts that young visitors got to make outdoors at the Bayfield Public Library midday on July 8. 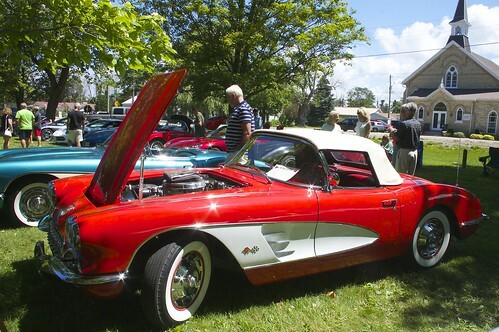 Everything old really is new again at the 32nd Annual Bayfield Antique and Collectibles Show to be held Aug. 11-13. New this year, admission to the Gala includes free admisstion to the show on Saturday and Sunday! Tickets for the Gala are on sale now at Brandon Hardware and JMR Collections both in Bayfield or by calling 519 565-4102. The Friday Gala is the perfect time to mingle with dealers and enjoy some wine and cheese from 6-9 p.m. Attendees will also get a head start on the stamping of their “Your Passport to Future Treasures” to be entered into a raffle for three awesome prize packages. In addition, visitors to the Gala should be on the look out for models dressed in fashions of yesterday. These gals will provide a sneak peak at what will be shared during a Vintage Clothing and Accessories Fashion Parade to be held on Sunday afternoon from 1-2 p.m. and sponsored by JMR Collections on Main Street. The Show will be open on Saturday from 10 a.m. to 5 p.m. and Sunday from 10 a.m. to 4 p.m. Admission on these two days is $5. 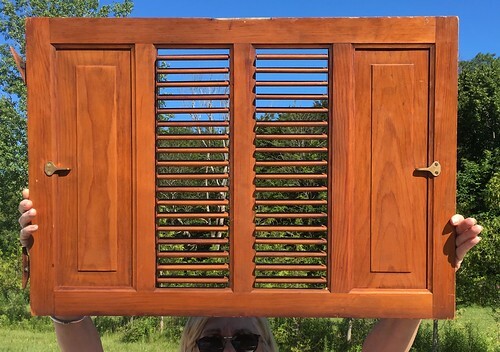 Another new feature of the 2017 show is an opportunity to have family heirlooms or special finds appraised by Tim Saunders, of Three Squirrels Antiques in Bayfield. There is three-item limit and donations are appreciated. As always the fabulous Cafe will be open during show hours on Saturdays and Sundays when visitors can enjoy a very reasonably priced sandwiches, sweets and cold beverages or coffee. Proceeds from this event go toward Trinity Anglican Church’s needs and outreach. So who is coming to this year's event? Seller Spotlight is an occasional, question and answer feature in the Bayfield Breeze to highlight dealers that will be taking part in the show and sale. The second business to be featured is “Land and Ross Antiques & Design”. How long have you been a dealer? We established our business in 1980 and purchased our first store in 1982. 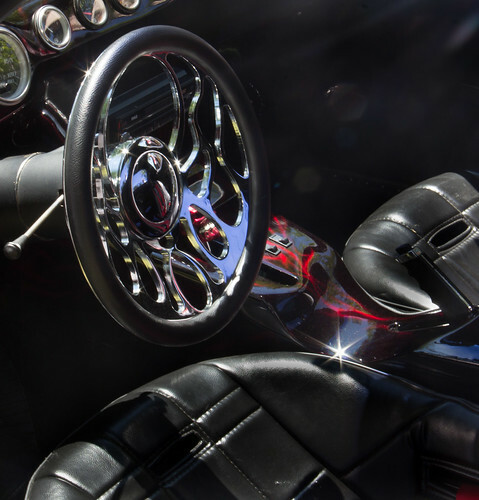 Do you belong to any professional organizations, like dealer associations, appraiser associations or organizations related to specific types of merchandise? Canadian Antique Dealer Association, it has a code of dealer conduct and strict rules about stating all restorations. 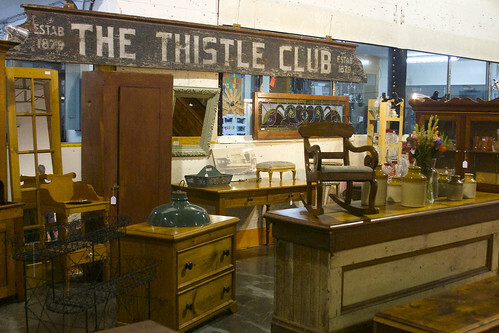 Do you offer antiques, collectibles or both? 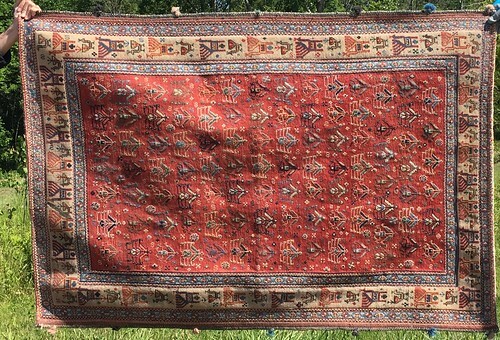 We have always dealt in a wide range of antique items. We also offer restoration services as well as a custom design and build program. Many people think of us as furniture dealers but we sell a wide range of glass china and decorative accessories. Anything you would like to add about your business? We offer full exchange on all antiques sold and are open all year round. We deliver regionally and shop nationally. 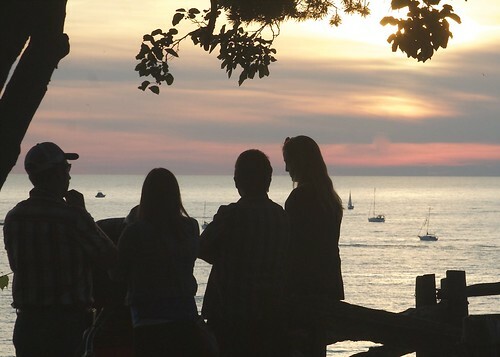 Hundreds gathered along the shoreline and pier to view the sunset and Boat Parade on Saturday night, July 8th, including several folks who found a great vantage point at Pioneer Park. 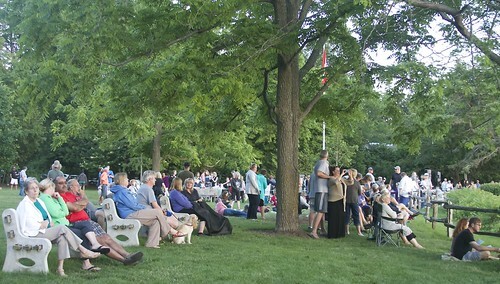 As predicted Pioneer Park was a very active place on the evening of July 8 as budding artists converged on this lakeside green space. And the sun cooperated providing an amazing subject for all to copy onto canvas as it set producing lovely muted colors of pink, orange and violet. 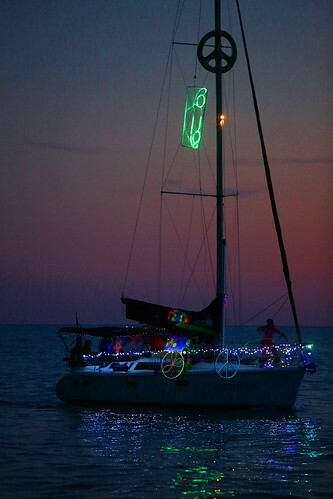 Well over a hundred people gathered in the park to view the sunset and watch the third annual Boat Parade on the tranquil waters below. They were also in for a special musical treat as singer Adam Lang performed several numbers with his guitar and harmonica as accompaniment. 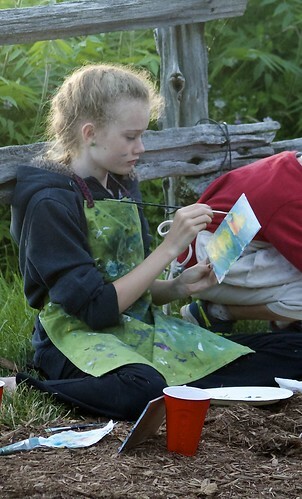 Special thanks to the staff from Kryart Studios of Bayfield who came to the park with everything inspiring artists needed to paint a beautiful Lake Huron sunset. 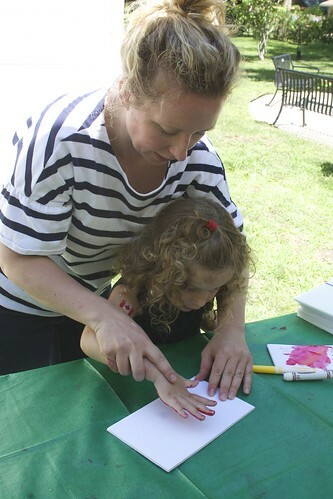 They will be back at the park for these free painting sesssions on: July 22, Aug. 5, Aug. 12 and Aug. 26. Please note rain dates are scheduled for the following night if the sun fails to cooperate. 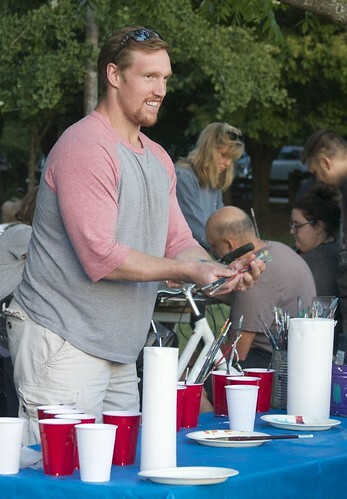 July 8th marked the first of five Paint the Sunset Nights at Pioneer Park. The next one is set for July 22 (rain date July 23). Staff from Kryart Studio on Main Street in the village were on hand to help out and supply everything that a budding artist would need to create at this free event. No two sunsets are alike both on canvas and in the sky! 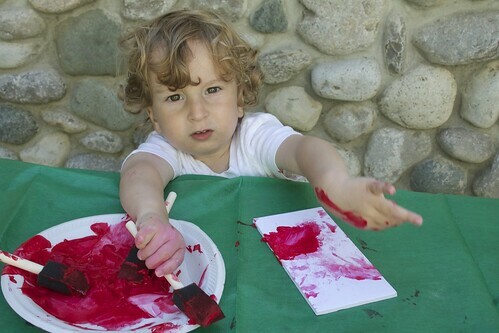 All ages and skill levels enjoyed participating in the painting. 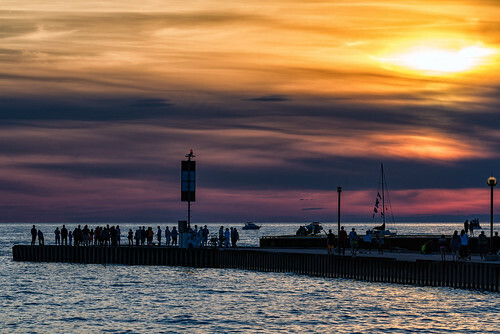 It appeared that a potentially record breaking crowd filled Pioneer Park on Saturday night - some came to paint, some came to listen to music, others came to watch the Boat Parade - all came to view the sunset. 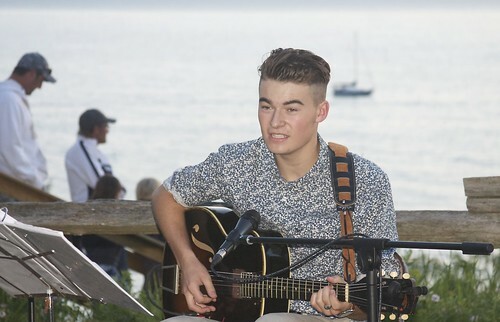 Singer Adam Lang performed several numbers with his guitar and harmonica as accompaniment. Due to the amount of discussion and requests from residents to have a meeting regarding the proposed development at 89 Main Street South, Municipality of Bluewater Councillor and Bayfield Ward Representative Bill Whetstone has booked the Bayfield Community Centre for a special meeting to be held on Sunday, July 16 starting at 1 p.m. This meeting will provide an opportunity for him to listen to both the positive and negative comments on this proposal. All are welcome. An online petition has been created regarding the proposed development at 89 Main Street South in the village. The petition entitled, “Preserve Bayfield, Ontario's heritage culture - say "NO" to corporate encroachment” that will be sent to the CAO of the Municipality of Bluewater Kyle Pratt. It was launched midday on July 11 and as of publishing time had generated 153 signatures. We recognize that “Timmy’s”, despite being majority-owned by Brazilian/American investment firm 3G Capital is, to many, a Canadian institution. We are also aware that property designated for the proposed development is zoned as commercial. 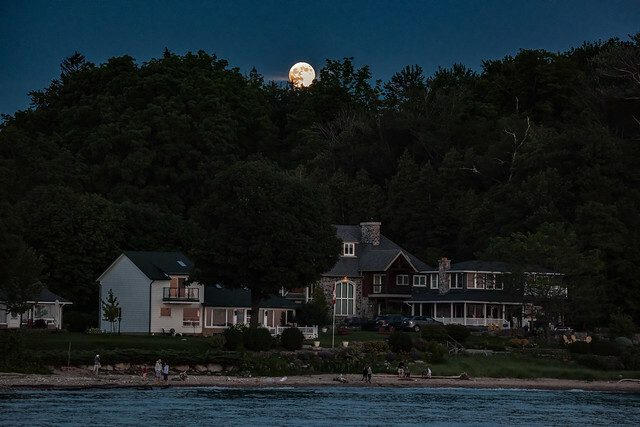 Blue Bayfield is the recognized voice of the environment in the region and is indeed recognized internationally for its environmental leadership. Our mandate includes working to reduce the plastics in our lake and river. There is a substantial body of evidence that indicates that the Great Lakes contain as much plastic debris as the oceans. The citizens of Bayfield in cooperation with Blue Bayfield, The Bayfield River Valley Trail Association and Love Your Greats, regularly clean the streets and beaches of debris. As in many communities that do the same, plastics and other containers from fast food outlets rank second only to cigarette butts in quantity collected. In volume, plastics clearly rank first. While wrappers and cups are a concern, plastic straws and polystyrene containers risk breaking down physically into micro- and nano- particles after they enter our water and will not bio-or photo-decompose for hundreds of years. These same waters are our source of drinking water. Most treatment plants cannot filter out these micro- and nano-particles and microbeads associated with cosmetic and personal hygiene products. In addition, aquatic species assume these plastic bits are food. As a Blue Community we are also conscious of the impact of idling cars on the air quality. A check with environment Canada air quality reports will demonstrate that our region is prone to high levels of air pollutants. In making its decision, Council should take into consideration the not insignificant impact that “big chains” can have on local businesses. These locally owned and operated businesses have a history of engagement in all aspects of community life. What will be the impact of yet another coffee restaurant, variety store gas station when two already exist on Hwy 21? Will the entry of this giant change the whole nature of our village by threatening the survival of our five existing “coffee shops”? Furthermore, what will be the impact of a Tim Hortons presence on the over usage of our limited sewage treatment facility? This village prides itself on retaining its historical character and its citizens spend thousands of volunteer hours protecting its heritage features and environmental quality. We ask Council to support the village’s efforts to improve the “first impression” visitors have of the village, that which they see when driving on Hwy 21. We believe that having this addition to our gateway is counterproductive. At its Special Meeting of Council on July 4 immediately following the Committee of the Whole, the Municipality of Bluewater Council accepted the tender to Clean and Re-Coat the Roof Trusses at the Bayfield Arena from Glavin Coating and Refinishing in the amount of $88,000 plus HST. Mayor Tyler Hessel and CAO Kyle Pratt were given authorization to sign the contract upon receipt thereof and Council directed staff to transfer the additional funds from the Rec & Park Reserve for Contingency and replenish the reserve in the 2018 budget. Get Ready! The Pioneer Park’s 70th Annual Rummage Sale is this Friday, July 14. Get Set! It all happens at the Bayfield Arena. The outdoor sales begin at 6:30 p.m. The arena doors open at 7 p.m. and the Silent Auction begins at the same time. Go! All items are full price from 7-8 p.m. There are drastic reductions to half price from 8 p.m. to 8:30 p.m. And then tradition dictates that grab bags are sold starting at 8:30 p.m. because everything must go! Those who attend are asked to keep an eye on the Silent Auction tables for bid closing times. School is just out and already the Bayfield Agricultural Society (BAS) is letting everyone know of an educational event to be held on July 15. The BAS is organizing its second Breakfast on the Farm event on a dairy farm from 8:30 to 11:30 a.m. Located at 41090 Mill Road, East of Brucefield, the hosts Tyler, Emily, Henry and Patti Hendriks welcome everyone to see their 95 milking Jersey cows in a brand new facility. This year the farming operation will feature Jerseys and the barn will highlight a new tunnel construction method for ventilating the space within it. With any tour of a modern facility, biosecurity risks are a concern so there may be a boot bath needed before entering the barn and no pets are allowed at the farm. In addition to learning about modern dairy farming, everyone attending will be served a hearty breakfast. This year the BAS is pleased to partner with the Londesborough Lions Club to prepare the meal consisting of sausages, bacon, eggs, pancakes with maple syrup, toast and milk or coffee. The meal can be eaten under a tent set up to keep everyone sheltered. Visitors will be able to eat at the new tables the BAS bought recently. The children will have some activities to keep them amused while their parents take time to visit with neighbors and friends. There will be some machinery to look over and several organizations will have booths set up to explain what they do to support our agricultural industry in this area. There will be tickets available at www.bayfieldfair.ca. Directors will have tickets and they can be obtained by calling 519 440-6639, 519 482-5490, or 519 482- 9296. Extra tickets were made available this year to accommodate more visitors. A few will be left at the gate but it would be wise to obtain them in advance since the event was sold out in advance of the Breakfast date last year. Volunteers are always welcome. If you would like to assist with the event, contact the BAS through info@bayfieldfair.ca. July 15 should provide a great opportunity to learn what is behind another barn door in the community. Back by popular demand, this month’s Bayfield Historical Society (BHS) guest speaker is Bayfield’s own Dr. Charles Wallace. After a seven-year hiatus, Dr. Wallace has agreed to continue with his “Long Road from India to Bayfield” life story. Do not worry if you were not present for his first presentation; he has so many stories to tell that this presentation will be a most interesting event in itself. This month’s meeting will be on Monday, July 24 commencing at 7:30 p.m. at the Bayfield Lions’ Community Building. Refreshments will be served at the conclusion of the meeting, memberships are available and all are welcome to attend. The Bayfield Town Hall Heritage Society (BTHHS) is pleased to announce another tribute performance, on July 29. This one features Southern Ontario artist, Marty Allen, celebrating the music of the great Johnny Cash. 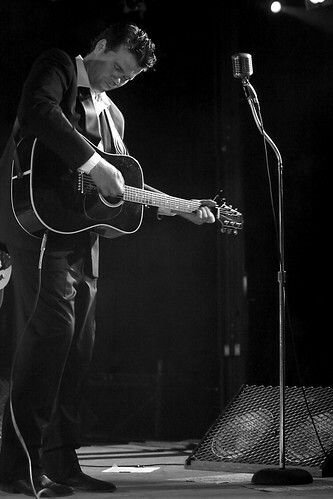 Many of us grew up with Johnny’s music, but younger people may know it best from the 2005 movie hit, “Walk the Line”. Allen was named after the late Marty Robbins and weaned on Sun Record artists Elvis Presley and Cash. He believes that “Honky-tonk and Rockabilly music is as much about life as it is about music”. Allen went on to form his own band, the Cadillac Cowboys, with Dave Tufford, electric guitar; Cory Richardson, upright bass; and Mike McDowell, drums. He has released five independent albums: “Daybreak’s Coming”, “Marty Allen”, “Living Life”, “Blue Church Road”, and the “Sun Sessions”, which he recorded at the legendary Sun Records Studio in Memphis Tennessee, where B.B. King, Presley, Cash, Carl Perkins and Jerry Lee Lewis all got their start. To learn more and to check out his music, go to www.martyallenband.com or YouTube. Organizers note the people should get their tickets soon, as they are expected to sell out. Tickets are $20 ($25 at the door, if any are left). Doors open at 7 p.m. and the concert starts at 7:30 p.m.
For tickets, call Pat Pal, 519 565-5340 or Sandy Scotchmer, 519 565-2830, or go to www.ticketscene.ca. The BTHHS thanks OLG for their sponsorship of this event. Under a threatening sky about eight vintage trailers parked for the night on July 9 in the Bayfield Agricultural Park. The local DJ who plays at the Sunday Outdoor Market continued to pump out his tunes as each trailer found its resting spot for the night. One of the trailers in the carava was over 50 years of age and was made in Hensall. The small group of travelers began their journey on July 6 in the Ridgetown area and has been working north along the Lake Huron shoreline. One young family with three children have enjoyed all the experiences they have had in each small community including an indigenous community where they were able to participate in some of the activities being put on. 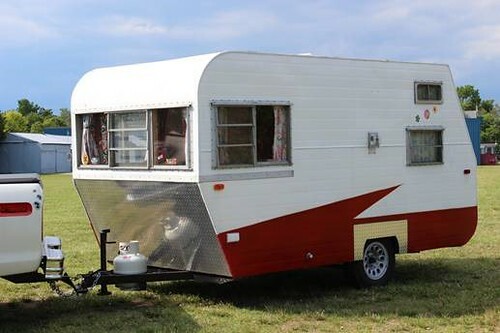 The trailers were a great reminder of how traveling was done many years ago. 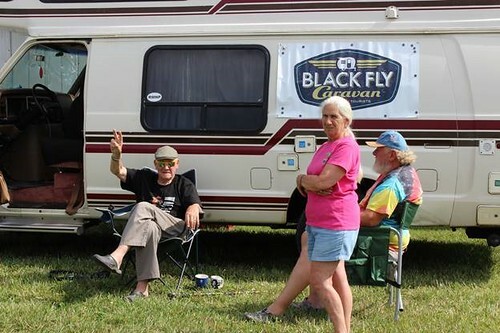 Rick Meyers, who organized the excursion of the Black Fly Sunset Caravan, wanted to thank Shop Bike Coffee Roasters for its hospitality. While in town, the group planned on taking a tour of downtown Bayfield and definitely was going to see the harbor. The trailers were a great reminder of how traveling was done many years ago and is still being enjoyed today by groups such as this. 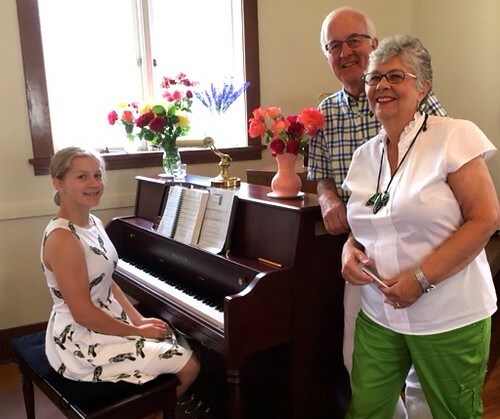 The congregation of Knox Presbyterian Church in Bayfield is inviting the community to come and enjoy a delicious fish dinner with them on July 29 at the Bayfield Community Centre. Meal service for this seventh annual event will run from 4:30-7 p.m. Fresh Whitefish is the main event with homemade tartar sauce served alongside salad, potatoes and a roll. Dessert features include assorted homemade pies, squares and cookies. Eat in or take-out. Tickets are available now by calling Bettylou at 519 565-4770. Cost is $18 in advance and $20 at the door per adult and $10 for children 12 and under. July 18; Aug. 3 and 15; Sept. 7 and 19 are dates that can be booked this summer. The Bayfield Hearing Clinic offers appointments from 9 a.m. to 4:30 p.m. The clinic offers: hearing aid adjustments and repairs to all makes and models, no cost hearing tests, new prescription of hearing aids, wax removal, hearing aid battery sales as well as hard of hearing assistive devices. Please call Gould at the Bayfield Hearing Clinic, 1-855-396-6026 to book an appointment. On time and on budget - these days, it’s not very often this can be claimed at the completion of a multi-month construction project. Rapidly escalating costs of materials, work delays due to inclement weather, hold-ups in deliveries of goods and services for a variety of reasons and many other excuses frequently affect the timing and cost of a new project. 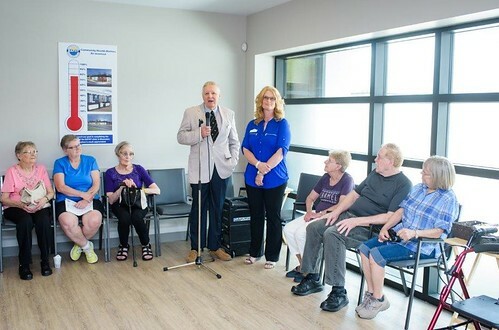 Not so with the Bluewater Area Family Health Team (BAFHT) facility in Zurich which celebrated the occasion with an Open House for suppliers, sponsors and patients on June 23. More than 200 people attended the event with Bluewater Mayor Tyler Hessel, MP Lisa Thompson and the current BAFHT Board of Directors with Chair, Ric Grise acting as master of ceremoneis welcoming guests. The new BAFHT facility has a program and exercise room. 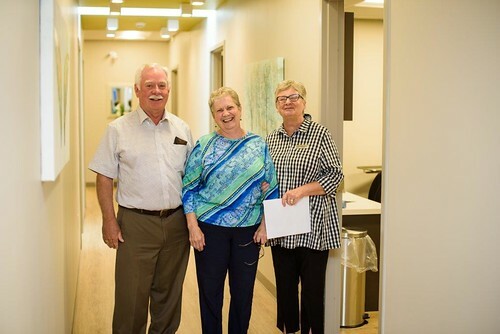 Patients and donors, Doug and Joyce McBeath with retiring BAFHT Board Chair Barbara Brown. BAFHT Board Chairman Ric Grise and Executive Director Paula Kroll took questions about the clinic from visitors. 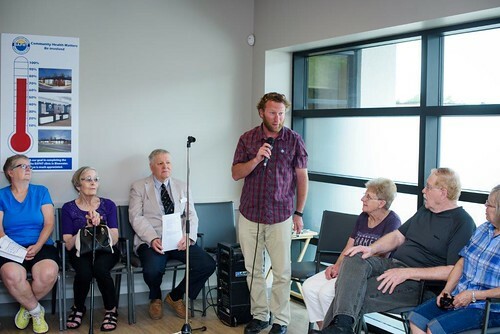 Bluewater Mayor, Tyler Hessel spoke to visitors at the Open House held on June 23. Retiring Chair Barbara Brown and Director Steve Haberer pitched in with BAFHT staff that included doctors, nurse practitioners, nurses as well as Paula Kroll, executive director, who together with office personnel all became fully engaged with visitors and acted as tour guides. 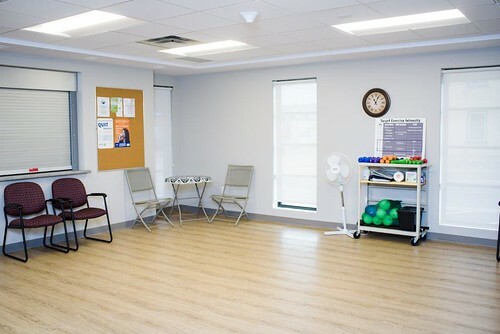 Event organizers feel that the new BAFHT facility is impressive and the number of health care programs being introduced will surely help the clinic become a health care hub for the community and surrounding area. Architect, Brad Skinner of Skinner and Skinner, of London, handled the extension and refurbishing of the facility. K&L Construction (Ontario) Ltd, of London, carried out construction. Shane Burch was Project Manager while Tony Kester was on site every day as Site Supervisor. Already,1,400 patients have registered with the BAFHT for health care from Zurich and Dashwood, 650 from Hensall and Exeter, 600 from Grand Bend and 600 from Bayfield. Some patients live even further afield – from as far north as Kincardine and as far south as Sarnia. 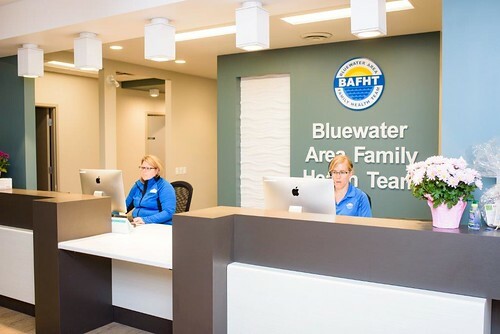 Residents in the Bluewater area looking for a family doctor should contact Executive Director Kroll at 519 236-4413 or e-mail at paulabafht@hay.net. Lukas Schilder is a chicken farmer in Huron County with centuries of farming in his bloodline. Like others in the agriculture sector, he is keenly aware of the advantages that adopting new technology brings to his business. 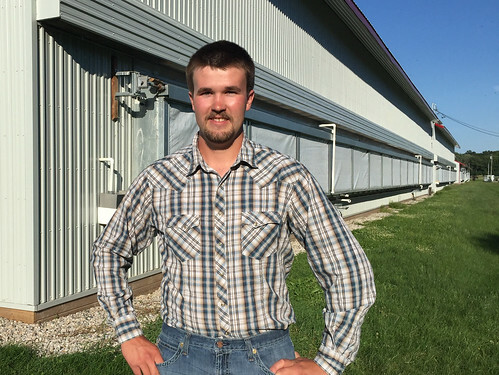 Looking to invest in a new chicken barn, Schilder and his family recognize an opportunity to connect their farm operations with the expectations of consumers and grow their brand. Guided by a sector-wide commitment to animal welfare, Schilder is planning to equip a new free-range facility with cutting-edge technology designed to monitor and broadcast information about the state of his flock to stakeholders. Some of the technology being considered involves a live 24/7 public video feed to demonstrate the care and treatment his chickens receive. In April, Huron County Council partnered with Comcentric – a cooperative of local Internet service providers – to submit a funding proposal to the Government of Canada’s Connect to Innovate program. The project proposes to connect 98 per cent of Huron County’s population, including the Schilder farm, with high-speed fibre within three years. Expected to cost $31.5 million, the project requires a partnership with the Government of Canada to proceed. To leverage an investment by the federal government, Huron County Council has committed $7 million over seven years. Huron County is one of the most agriculturally productive regions in Ontario with annual commodity receipts totalling $1.2 billion. 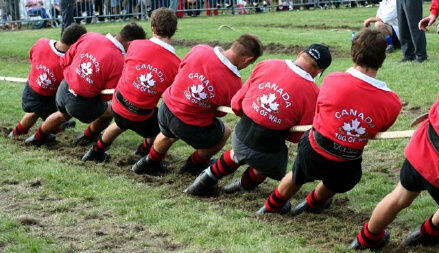 Unbeknownst to many, Huron County is home to a Tug of War team that has competed around the world representing Canada for two decades. The 2017 International Plowing Match and Rural Expo (IPM 2017) Executive Committee is proud to partner with Huron County’s own Bluewater Tug of War team to host a Charity Pull on the final day of IPM 2017, Saturday, Sept. 23. The Charity Pull is open to anyone wanting to submit a team of eight to 10 people with a registration fee of $100. Each team will be pulling on behalf of a self-selected charity in a winner-takes-all tournament. Advisors to the Bluewater team will be offering free coaching sessions for teams registered to participate in the Charity Pull. The Pull will run from 10 a.m. to 2 p.m. Blaine Pryce is accepting registrations at 519 520-7317 until Aug 31. This is not a first for Tug of War at an IPM hosted in Huron County as Bluewater and the Canadian Tug of War Association (CATOWA) hosted a league pull at IPM 1999 in Dashwood. Ten professional teams came to pull, eight from across Canada and two from USA. CATOWA will again host a league pull at IPM 2017 with four teams confirmed to participate. This will give charity pullers and attendees the opportunity to see proper techniques and the skill of professionals. If inspired, the Bluewater Club is looking for men and women to join ensuring the teams growth and long-term success. Coach Jim Connolly can be reached at 519 521-9387 if interested. IPM 2017 has committed itself to telling the stories of families in agriculture, in Huron County’s history and development of the Plowing Association, and their impact on agriculture in Huron County. The Bluewater Tug of War team is much the same. With multiple siblings on the team, with multi-generations pulling together, sport is being used to celebrate our families. Read more about the Bluewater Tug of War families and their success in the August 2015 edition of Sportsnet Magazine, the June 2017 edition of Rural Voice, Bluewater’s website tugofwar.net or the CATOWA website catowa.org. IPM 2017 takes place Sept. 19-23, with advanced tickets being sold at every municipal office in Huron County for $15. Tickets will be available at the gates on the day of for $18 per person. More information about all the programming and events for IPM 2017 can be found online at plowingmatch.org/ipm-2017 or the Facebook Page Huron IPM 2017. Organizers report that the Taw Connors concert scheduled for the Hensall Heritage Hall, this Saturday, July 15 has been rescheduled for Sept. 23. They apologize for any inconvenience and note that tickets purchased for this weekend’s performance will be honored or may be refunded. In his show, Taw Connors takes to the stage in a tribute to his late father “Stompin' Tom" Connors. "Stompin’ Tom” was a Canadian country and folk singer-songwriter who is credited with writing more than 300 songs in his lifetime. His music focused exclusively on the Canadian experience and hits such as 'Bud the Spud', 'Sudbury Saturday Night' and 'The Hockey Song' made "Stompin' Tom" a national icon. Taw has been quoted as saying, "I'll never fill that man's shoes" but his voice sounds uncannily like his fathers and thanks to Taw’s "The Canadian Stompper" tribute concert series, the music of “Stompin' Tom" is alive again at venues across the province. The show will start at 7p.m. at the Hensall Heritage Hall located at 108 King Street. Tickets are $35. For tickets please call Kathy at 519 263-2343. They are also available at D&D Variety in Hensall, or Ticketscene. Those who plan to attend are asked to get their tickets early so they don't miss this special opportunity to celebrate Canada and everything that makes this country unique. Once again The Huron County Food Bank Distribution Centre will sponsor The Back Pack for Kids Program for the 2017-18 school year. Registration for families has begun and will conclude on Aug. 18. This year the Salvation Army has volunteered to register the recipients and then prepare the backpacks. Anyone who could benefit from this program should contact 519 524-2950 or 519 482-8586 to register. The backpacks will be distributed during the last week of August. Back packs for children registered from Bayfield will be distributed by the Bayfield Foodbank (Feed My Sheep). The Huron County Health Unit (HCHU) is reminding people to be careful if they come across discarded needles at beaches, parks or other recreational areas. A child should never touch any needle. Tell them that used needles can be dangerous and might make them sick. Children should tell an adult where the needle is. If a needle pokes a child, he/she should tell someone right away. The child will need to see a healthcare provider as soon as possible. Get a free sharps container if you find a needle. Call the health unit at 519 482-3416 or after hours at 519 482-7077 to ask where in your community you can get the container and where you can take it when you have put the sharp object in. If that is not possible, bring a non-breakable, puncture proof container with a screw-top lid to where the sharp object is. Use a thick plastic jar, empty bleach bottle or water bottle. Use pliers, tongs or tweezers to pick up the object. If it is a needle, hold the needle tip away from you. Put the needle into the container needle end first. Take the container to the site recommended by the health unit. If you have been scratched, poked or cut by a discarded sharp object, let the cut bleed freely. Wash the area well with soap and water. Afterwards, apply an antiseptic like rubbing alcohol or peroxide. Follow up with your healthcare provider as soon as possible. Like all health units in Ontario, the HCHU offers a needle exchange program with community partners in the county. Providing injection drug users with sterile injection equipment helps reduce the transmission of HIV, hepatitis B, hepatitis C and other blood-borne diseases. This reduces risk for both injection drug users and the larger community. An agreement has been signed to purchase the house that will become the Huron Residential Hospice. The property, located between Clinton and Goderich on Hwy 8, has recently been rezoned to permit a four bed residential hospice, and will officially be owned by Huron Hospice Volunteer Service (HHVS) at the end of August. There will be an open house event announced soon, but some renovations and construction will be needed to meet life and fire-safety building codes for a hospice before it can officially open in March 2018. To date, all donations have been made through HHVS, a registered charity with over 25 years of experience providing hospice care in this region. A residential hospice has been part of the HHVS strategic plan for over a decade. The residential hospice capital campaign is titled, “Moments Matter” because the residential hospice aims to support families through the process of losing a loved one and embracing quality-of-life in their final days. 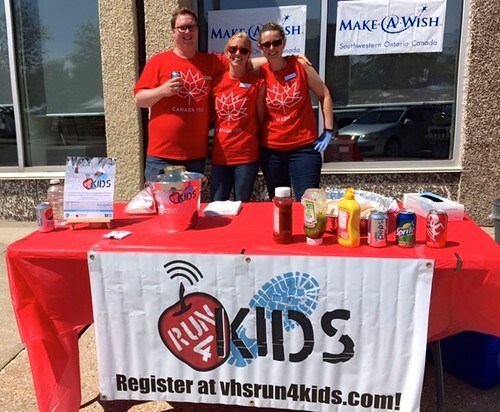 Community fundraisers have been popping up all over the County. A strawberry social at Goderich Place, the Huron County Warden’s Charity Golf Tournament, raffle tickets for a quilt, Hydrangeas for Hospice, are all examples of how independent groups are coming together to raise funds for residential hospice. Many private donations and memorial donations have also been arriving for the project. For more information about the project, and to donate, visit www.HuronResidentialHospice.com or contact Huron Hospice Volunteer Service office at 519 482-3440 x6301 or Gwen Devereaux at 519 870-3667. Follow the project on Twitter @HuronRezHospice and Facebook @HuronResidentialHospice. 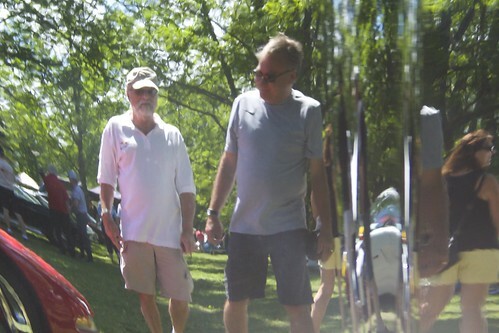 Bayfield has been home to a Country Flea Market for several decades. In more recent years, it has found a new home in Agriculture Park; a home that offers plenty of parking as well as some green space for children to run carefree. The Bayfield Agricultural Society provides this home for the market that is open on Sundays from 7 a.m. to 2 p.m. (maybe a little longer depending on the crowds). 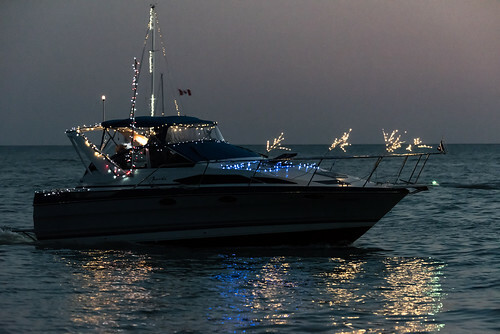 Several hundred people watched the third annual Boat Parade from the pier, Pioneer Park and Harbour Lights Marina. Local residents took part in the Boat Parade including Dave and Lynne Gillians and Pat and Roger Lewington. This year there were prizes for participants. 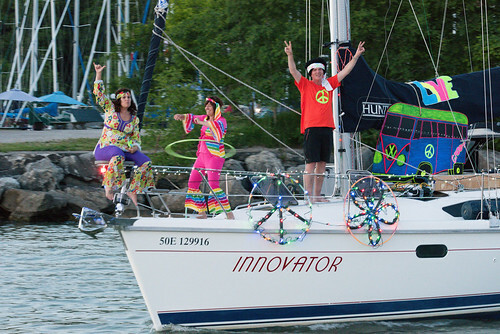 The sailboat “Innovator” earned an honorable mention with their fab 60s theme. 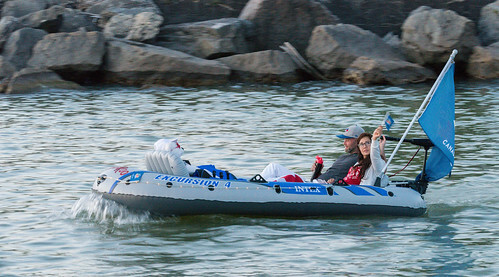 Owners of sailboats, motorboats, canoes and rubber dinghies all got into the spirit of the parade. The winner of the best decorated paddle boat enjoys a turn on the tranquil lake. Hawaii meets Bayfield with this very tropical entry in the parade. 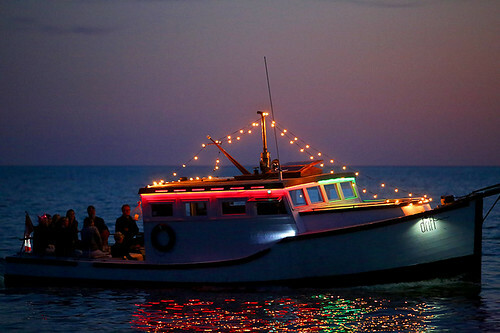 On July 8th, the Bayfield and Area Chamber of Commerce (BACC) hosted their third annual Boat Parade and it proved to be a picture perfect night. This year there were prizes for the best Sail Boat, Motor Boat and Paddle Boat. 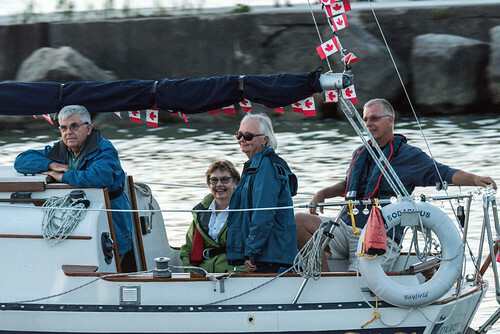 Twenty-two boats competed for the prizes, Bayfield Farmers' Market Bags loaded with Bayfield’s favorite goodies and treats! Several hundred people watched the spectacle from the pier, Pioneer Park and Harbour Lights Marina. 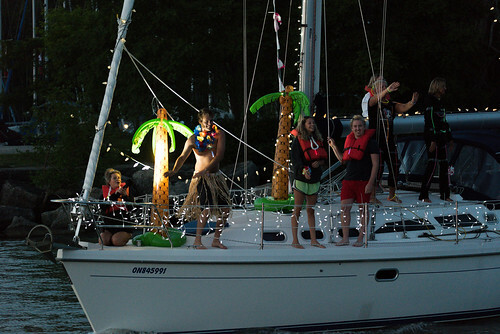 The winners were: Best Sail Boat – “Styx” for the disco theme. Honorable mentions were to “Feather” with the string lights and “Innovator” with the 60s theme earned honorable mentions. Best Motor Boat – “Drift”. 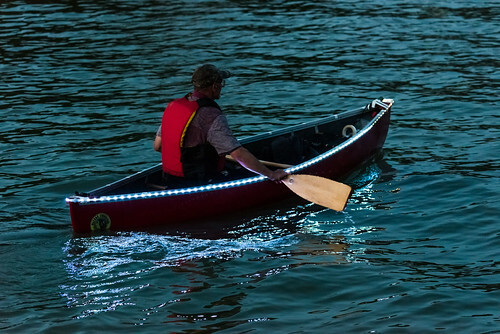 Best Paddle Boat - The canoe with the rotating colored lights. 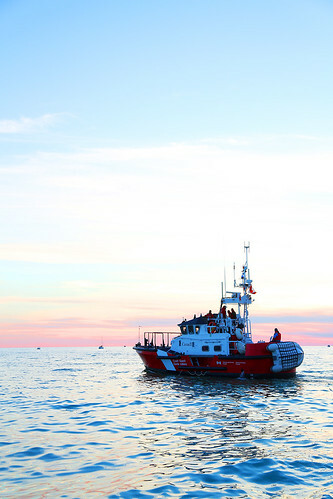 Organizers are appreciative to all those who participated and especially to the Canadian Coast Guard for making the trip to Bayfield as well. 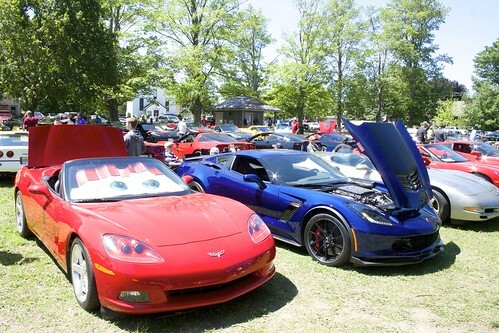 Bayfield Vette Fest 2017 had a record-breaking weekend when 319 Corvettes entered into the show, while an additional 18 cars were located outside Clan Gregor Square. 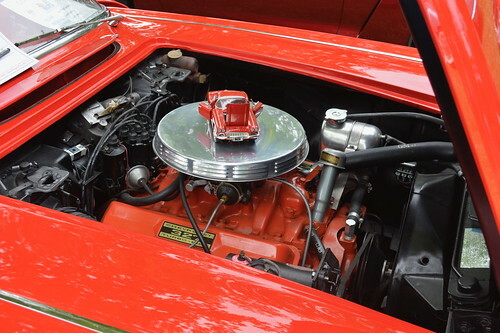 Perhaps the oldest Corvette in the park (1954) was this one owned by McKichan from Strathroy, ON. It attracted a lot of attention from show visitors. 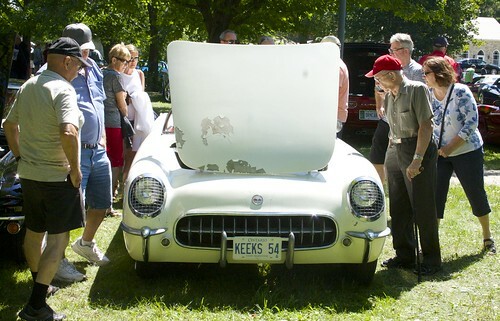 Dean Tully, of Bayfield, brought this 1958 model to the park on Saturday. 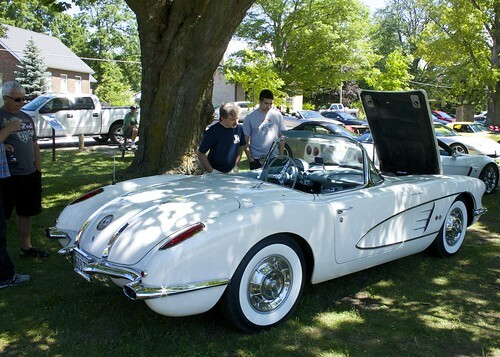 Cindy and Lennie Slipacoff, of Sarnia, ON, participated in Vette Fest with this beautiful 1960 model. 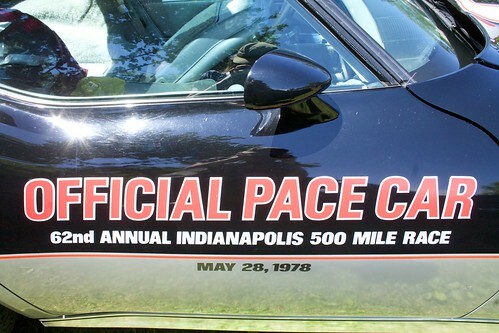 Scott M., of Hamilton, ON, brought this corvette to the show that was the Official Pace Car for the Indianapolis 500 in the spring of 1978. 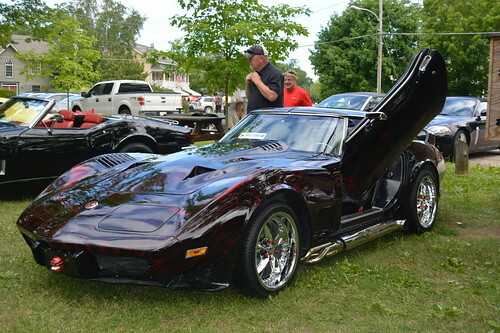 Dave Richardson, of Waterloo, ON, had a sense of humour when it came to displaying his red 2005 Corvette in the Square. 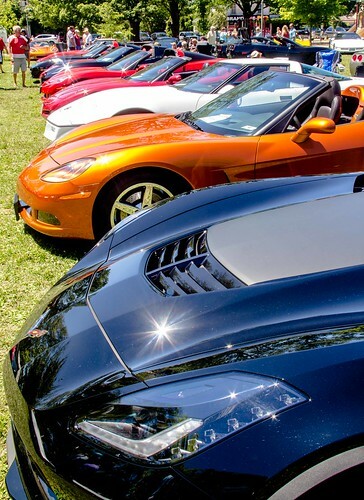 “A huge thank you to all who showed up with their Corvettes this weekend!” wrote the organizers of the event on their Facebook Page. They noted that the weather was great on both Friday and Saturday night. 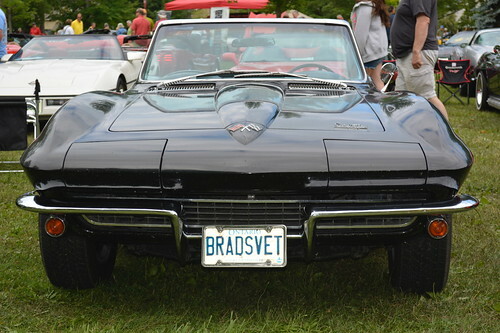 The Dark Horse Winery in Grand Bend was the destination for the 76 Corvettes that took part in the Friday Night Cruise. Organizers also expressed thanks to all the volunteers that assisted with the event as well as to all the village and area merchants that donated such beautiful door prizes and goody bag swag. The participants were so happy to receive such great items! 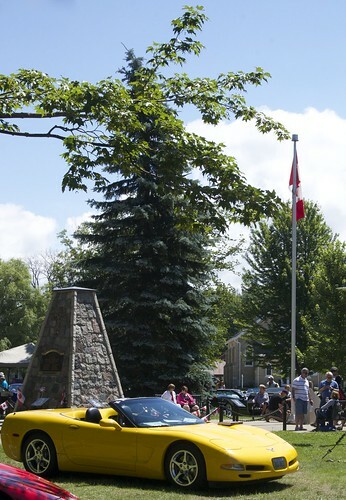 This 2003 Corvette owned by Jim and Donna Robbins, of Talbotville, ON, had a prominent position in Clan Gregor Square. 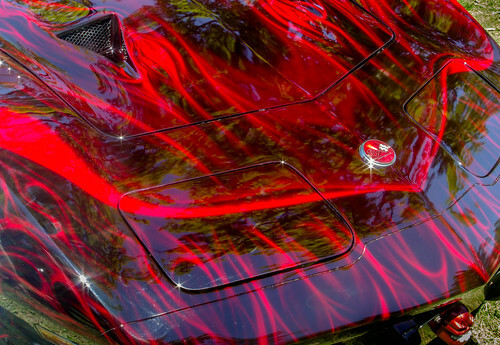 All the corvettes were gleaming in the sunshine so much so that these individuals could be captured in the reflection of a hood on a 2010 Corvette owned by Paul Ackert, of Norwich, ON. So the topic on everyone’s lips of late seems to be the proposed development at 89 Main Street South in Bayfield. Some may be supportive of the project. Others may be against it. Still others may be ambivalent considering it a done deal. But this is Bayfield and our residents have opinions and as awareness grows they are starting to express them. I have been watching with interest the petition regarding the project that was launched midday yesterday on Change.org to check the barometer on the issue.